Not being a particularly famous aircraft, it is surprising how many Sea Vixens have been preserved, one - XP924 - even being in flying condition. This contrasts with earlier Fleet Air Arm aircraft (such as the Wyvern or Scimitar) which are real rarities nowadays. One Sea Vixen and a nose section have even ended up in Australia! 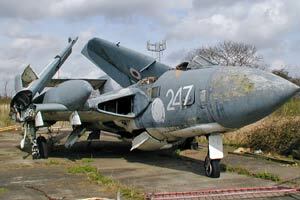 As the Sea Vixen was retired early in 1972, many of the airframes had several years of fatigue life left in them. Had the RN's carriers not been lost, it is feasible that the Sea Vixen could have been operational into the 1980s. After all, Lightnings were operational until the late 1980s, and were of around the same generation. The airframe itself, being designed for the pounding a carrier borne aircraft gets, is extremely tough. Certainly most landing accidents only took Sea Vixens off line for a few days while repairs were carried out. This and extensive anti-corrosion features also mean that examples at museums, even when parked in the open, have survived years of inactivity very well.